I'm not sure what Iriomatic checks will actually checks but could there be a way JW Validate checks for paired expressions? For example, checking to make sure there is a "senza sord." expression somewhere on the staff following a "con sord." espression. I don't know if you'd have to great a library or have a user create a library with such pairings or perhaps having 2 fields that the user would fill for each search but it would be a great way to check for muting, pizzacato, bells up, sul tasto and other technique changes that usually require an indication of a return to normal. Brass music, Woodwind Music, Concert Band Music, CDs, etc. The idiomatic tests are not hooked up in the current beta. The PDF lists the currently available tests. Would consider adding the ability for the plugin to check for duplicate hairpins (or other smart shapes). It currently does this for slurs but I'm finding a need for such a checker for a project I'm working on now where I'm doing alot of copy & pasting with the edit filter. I guess I'm being a bit sloppy. There's one other aspect of rest placement that Finale has never handled properly. Rests are always supposed to be placed on a staff line. If they fall outside the staff, they should be at a height corresponding to where a ledger line would go (though I think there can be exceptions in this case). 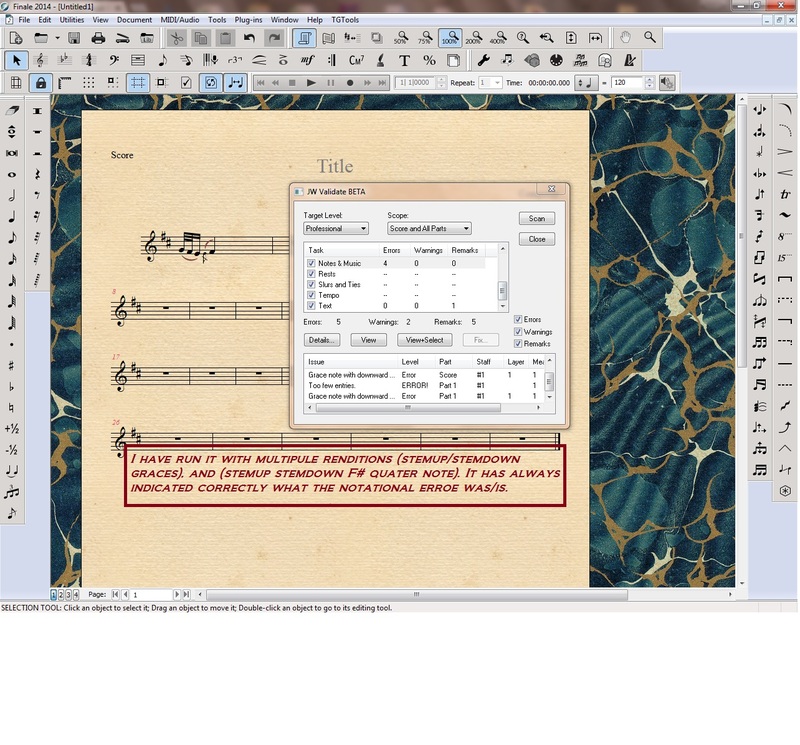 When transposing or changing the key of a passage that includes non-floating rests, those rests are moved up or down by the equivalent interval. In many cases (such as transposing up or down a second), they end up sitting on a space and must be fixed manually. Could JW Validate scan for rests with an odd (+ or -) number displacement and warn the user? In Finale 2014 JW Validate is reporting that certain accidentals are hidden when, in fact, they are not. In the "Issues" column text isn't showing when, I believe, a "System not locked" alert is given. Clicking "Details" opens a window that simply says, "alert:". Also, can the "Issue" window show defined measure numbers instead of actual measure numbers? I've just started using this plugin and am very impressed with its possibilities. One suggestion for the future. 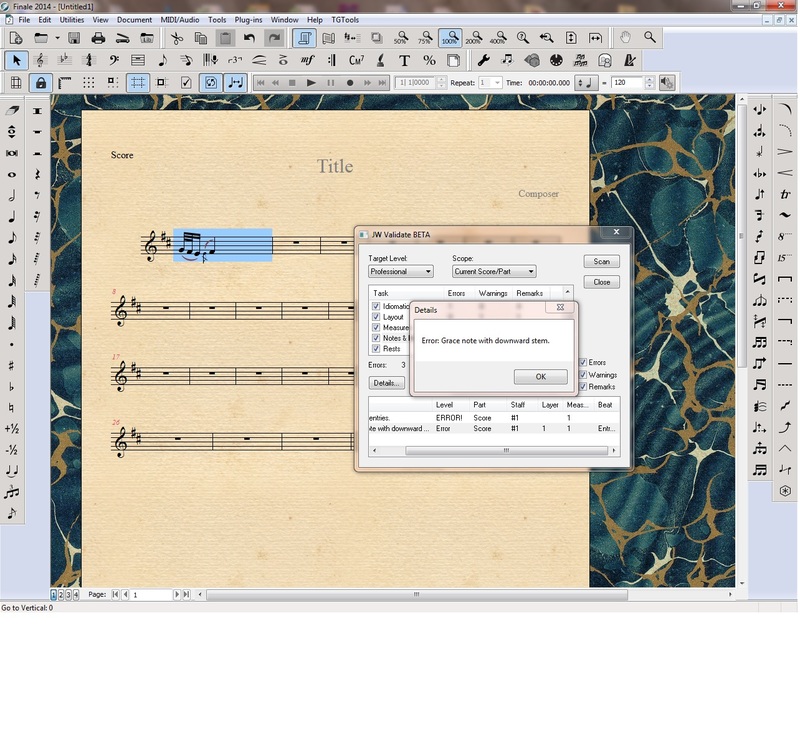 As an engraver I get a lot of files from different composers. One of the most common mistakes I see, is when the composer inserts a hairpin in the score without paying attention to which staff it's attached to. If this plugin were able to scan a file and alert the user as to any hairpin which is placed above the staff it's attached to, it would be a real time saver for the engraver. Trying to figure out the trick to the "Grace note with downward stem" issue. What sayeth the guru? This image has been viewed 298 time(s). Do you need a layout like this? This image has been viewed 266 time(s). That didnt work... i tried it lol. Do you man that you tried to flip the grace note’s stem downward - and that the stem did not flip? Finale switches to the Simple Entry Tool, with the grace note highlighted in purple. If the wrong note gets highlighted, just move the highlighting left/right with the arrow-keys. Hit the letter L key to flip the stem. If the stem does not flip, try the letter L key again. Oh i think im being vague. The JWValidate plugin is flagging this and all my grace notes as an error. I wanna know what im doing wrong, or if its just a bug... This is how it should be notated as far as i can tell. Graces opposed in lower voices have downstems. Jari has a contact link through his website.......www.finaletips.nu/probably get a more rapid responses there? His "JW Validate" plugin has been in beta version for quite sometime now and bugs should be best reported there. I can not say that I have ever had a misidentification of graces when using this plugin. 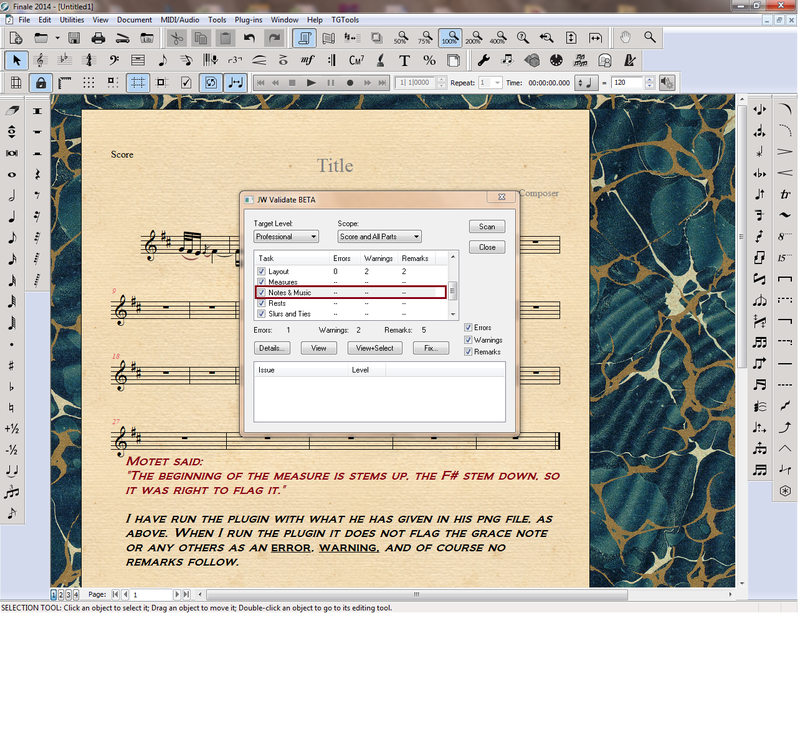 Have you tried a little experimentation with other documents that you have used graces? Perhaps it's the the non-grace-note F# with a downward stem that's causing it. Why is that stem down? What would be nice is if he would be so kind as to run the plugin again and take a screenshot of the Plugins report window. This image has been viewed 153 time(s). This image has been viewed 359 time(s). The beginning of the measure is stems up, the F# stem down, so it was right to flag it. I still do not display the issue that pianoguy36609 said has manifested with his Finale Score. Might be best if he attaches a musx. file that displays this issue for him? This image has been viewed 279 time(s). This file has been downloaded 219 time(s). Different versions of the plug-in? Could be. I'm running under windows with the most current version of Jari's Plugin. We have no idea of system or version the poster is. This file has been downloaded 277 time(s). I'm having the same problems as you are with the plug-in. Even with those bugs, it's a HUGE HELP!! Yamaha 621 Baritone Horn, blue pBone.